Allan Hayes: The generator installed by Delta to cover the power supply to Owheo and other buildings in the area couldn't handle the load and therefore power was off much longer than anticipated. The regular power supply was restored around 11.20am. There will be no further outage this afternoon as a result of this. Unfortunately Delta will have to re-schedule this maintenance work, which means we will have another outage in the near future. Allan Hayes: I have been notified by Property Services that the electricity supply to the Owheo Building will need to be shutdown this Thurs 12th April for two periods. Power is expected to be off between 8:30AM to 9:15AM and again between 4:30PM to 5.25PM, everything going to plan. Could be slightly longer should any problems be encountered along the way.This date and chosen times cannot be changed. The shutdown is necessary to allow the local lines company to perform much-needed network maintenance. In preparation for these outages the Departments Technical Group will require most undergrad labs, research labs and staff office computers be shutdown tomorrow night (Wed 11th) starting from 5pm except in cases where we have been previously notified they need to be left running that evening. We will shut these exceptions down the next morning (Thurs 12th) from 7am. We will leave essential services such as email, authentication, home directory file servers and network services running up until 8am on morning of Thursday April 12th. Once the first outage is complete around 9.30am, we will restart essential services and any undergrad labs required for that day and leave these running until 3.00pm, where they will be shutdown for the duration of the second outage. These services will then be restarted once again after power is restored. Staff and students should be able to power up and use computing devices safely between hours of 10.00am and 3.00pm but need to ensure they are turned off again by 3.30pm at the absolute latest. Power could drop out at any time from then on if the lines work is completed earlier than anticipated. Once again, feel free to start up your own computers any time after the second outage is over. On the day of the outages it would be advisable that any Computer Science undergrad students work from home or elsewhere (such as the Robertson Library) if at all possible, apart from those that have been advised to attend scheduled labs that day between the times of 10am and 3pm. All undergrad lab computers and other non-critical computing services won't be restarted until 6pm onwards that evening or possibly the following morning Fri 13th. The department today congratulates Maria Mikhisor whose PhD thesis '3D face tracking using stereo cameras with whole body view' has been accepted. "On the merits of her studies and passion for computer science, Kiri has received a scholarship from the Government Communications Security Bureau (GCSB) for women studying STEM fields at tertiary level. The scholarship awards the winning students with $10,000 towards their studies in science, technology, engineering and mathematics subjects at New Zealand universities." Read more about Kiri and this prestigious award here. Alistair Knott has recently co-organised two workshops on Uses of Artificial Intelligence in the Criminal Justice System, together with Colin Gavaghan (Law) and James Maclaurin (Philosophy), as part of their AI and Law in New Zealand project. One workshop was held in Oxford, and hosted by the Uehiro Centre for Practical Ethics. 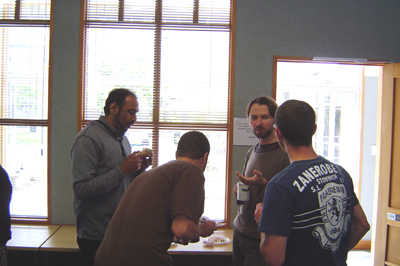 The other was held in Dunedin. Congratulations again to Dr Stefanie Zollmann for the $300,000 Marsden award for her project 'Bringing 3D to home videos'. The department congratulates Dr David Eyers, who has been promoted to Associate Professor, and Dr Yawen Chen, who has been promoted to Senior Lecturer. The promotions take effect on 1/2/2018. The department congratulates Dr Stefanie Zollmann who has won a $1,000,000 MBIE research funding award. Her three-year project is called "Situated visualisation to enrich sports experience for on-site spectators". Stefanie summarises the project this way: "Over the last couple of years, we have seen many major advancements in sports broadcasting as well as in the interactivity in sports entertainment. However, spectators at live sporting events still often miss out on this enriched content that is available to remote viewers through broadcast media or online. The main idea of our project is to visualise game statistics in a novel way on the mobile devices of on-site spectators to give them access to information about the sporting event. We will provide spectators with an enriched experience like the one you see in a television broadcast. For this purpose, we will use technologies like Augmented Reality to place event statistic such as scoring, penalties, team statistics, additional player information into the field of view of the spectators based on their location within the venue. Our research project will bring sports events closer to the audience, as well as bringing the spectators closer to the events and the teams". A more detailed summary can be found on page 24 of the MBIE successful projects list here. Dr Willem Labuschagne has retired from the Department after 18 years. In addition to his teaching role, Willem was our Postgrad Coordinator and also the university's DipGrad Course Director. In honour of his Logic papers, Willem was given a specially made light fan - a fan and a light each with their own switch, set on wood and under glass, inspired by Willem's phrase "consider the Light-Fan System" in his paper 'Entailment, Duality, and the Forms of Reasoning'. The highlight of the farewell was the other gift to Willem, a silver sword with its scabbard. The blade of the sword was engraved with on each side with a Willemism - 'Swift Sword of Sagacious Sorting' and 'Bloodthirsty Blade of Baneful Banishment'. Congratulations to Mika Smith, Kiri Lenagh-Glue and Holly Hanson! In March 2017, the International Office held the World's Challenge Challenge national competition in which students were invited to present an innovative idea to help support one of the United Nations Sustainable Development Goals. Three of our third year Computer Science students, Mika Smith, Kiri Lenagh-Glue and Holly Hanson, entered the competition with their unique proposed organisation TechOutreachers. TechOutreachers is an innovative social enterprise seeking to close the education gap in digital literacy globally. The organisation's mission statements are to train and place digital technology teachers in developing countries, as well as recycle and repurpose used tech hardware to redistribute to these countries. Amongst the top 5 teams at Otago, Mika, Kiri and Holly presented their vision on the night of the 23rd of March in front of the judging panel, and came first place at the competition. They have been awarded a fully funded trip to travel to Western University in Ontario, Canada, to represent the University of Otago and participate in the global World's Challenge Challenge against other competing universities at the end of May. Our PhD student Chris Gorman has been awarded a Microsoft Academic Research award covering Azure Cloud Services to the value of US $20,000. Applications for such grants can be submitted by PhD students directly; Masters and undergraduate students need submission to come from their supervisor. Next deadline is April 15, 2017. Associate Professor Ali Knott will spend the next two years working at a newly-formed AI company based in Auckland, Soul Machines. The company was launched yesterday: it's a commercial spin-off of Mark Sagar's Laboratory for Animate Technologies at Auckland University. Soul Machines will build simulated computer agents, using novel computer graphics and AI technologies. The AI approach is novel in using biologically-inspired neural networks as a core technology, and in 'starting from scratch', by focussing on modelling how babies learn about the world around them. Ali has been collaborating with Mark since 2014, as part of his ongoing Marsden project on language and sensorimotor cognition. For more information, you can read a piece on the company in yesterday's NZ Herald, or listen to a piece that ran on National Radio this afternoon. Learn about the rapidly expanding field of 'Internet of Things' with the NodeMCU board. We will provide all the basics you need to start your own projects! You will learn how to set up an electronic circuit, program it to sense and respond, and eventually upload your data onto the internet. There are many different applications for this kind of technology; you could have a self-watering plant or a website showing you the temperature in your home. We will provide all the equipment necessary, including computers, but you have the opportunity to buy the electronic board, sensors and components for around $20 at the end of the workshop so you can continue to play! The workshop will run on the 8th and 9th of December in the Computer Science Department, from 9am - 4pm with a lunch break around 12pm - 1pm. It is open to year 7 and up. Each day is charged at $60; but we highly recommend you come for both days. The teaching ratio will be 1 to 5. Please email annabelleritchie42@gmail.com if you are interested in signing up! The department was delighted to hear today that Dr Yawen Chen has won a Marsden Research Fund award of $300,000. Yawen's project title is 'Optical Network-on-Chips (ONoCs): Architectures and Routing Algorithms for Ultra High-Throughput and Energy-Efficient On-Chip Communications'. Read more about the project and the award at the Royal Society site here. 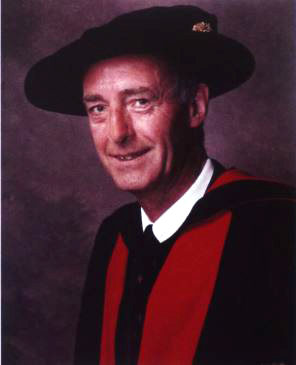 Emeritus Professor Brian Cox, our department's founder and first Head of Department has passed away today. For those of you who didn't know him, Brian was Head of Computer Science from its formation as a department in 1984 until he retired in 2000. Before that he was Director of the Computing Centre (now ITS). His funeral will be on Monday at Hope & Sons at 3pm. The Department welcomes our new lecturer Stefanie Zollmann, who has come to us having worked previously with ARL as a senior developer. Congratulations to Hamza Bennani for being awarded the 2nd best poster at the Dodd Walls Centre Symposium in Queenstown last week. Well done Hamza! ATOM, previously SciCo, is an OUSA-affiliated club aiming to provide learning and social events for science students. They have an upcoming event called Let's Talk Science where two University researchers (AP Zhiyi Huang and Prof Neil McNaughton) are speaking about their exciting research on brainwaves and the implications of it for us as students. This event is on the Wednesday 23rd of March at 5.30pm in Quad 4. The department congratulates Matt Crane, whose PhD thesis 'Improved indexing and searching throughput' has just been accepted. Matt's thesis is available here. This semester we are organising a series of seminars to discuss the impact of Artificial Intelligence (AI) on society. Recent advances in AI are focussing attention on several questions. Some are technical. What can AI techniques do now? What advances are we likely to see? Some are philosophical. What sort of thing is a machine 'with human-like intelligence'? If such a thing was created, what ethical obligations would we have towards it? Some are legal and/or political. What impact would intelligent machines have on our society? What legislation should control such machines? We feel it's a good time to discuss this question in an interdisciplinary environment, since no-one's an expert in all these areas. The seminars will run all semester, on Fridays from 3:30-4:30pm, in Owheo, Room G34. (They�ll take the place of the AI/graphics seminars for this semester.) The first seminar will be on Friday 4th March. At this seminar, there will be some short introductory presentations, and then a discussion about what form the seminar series should take: we don't have a set agenda, and would appreciate everyone's input. Looking forward to seeing you on Friday of Week 1! Computer Science postgrad Hamza Bennani has won the OUSA Teaching Excellence award for best Tutor/Demonstrator in Summer School 2016. Well done Hamza! Matt has been offered and has accepted a one-year contract (with an option to extend) as a Post-Doctoral Fellow under Professor Jimmy Lin, in the Department of Computer Science, at the University of Waterloo in Canada. Applications are invited for a full-time, confirmation path position as Lecturer in the Department of Computer Science. The successful applicant will be expected to teach at undergraduate and postgraduate levels, develop an active research programme, and supervise postgraduate research students. There are still places available on our Summer School papers COMP160 (General Programming) and COSC360 (Computer Game Design). For background on the COMP160 paper see here. Allso see the University's Summer School page for the paper. For more info on the COSC360 paper including a FAQ and examples of games produced by previous classes see here. You can also look at the University's Summer School page for the paper. Technology continues to evolve at an exponential pace. As we move further into the era of cloud, mobile computing and big data analytics we are starting to observe a new wave of innovation accelerators. From 3D printing, AI and robotics to bio- & nano-technology these new technologies are all developing exponentially. As the pace of change accelerates, Graeme Muller, the Chief Executive of the New Zealand Technology Industry Association, will share insights into the exponential opportunities that this could bring for New Zealand. Create something amazing with this November's Nature Hack! Callaghan Innovation and Landcare Research are challenging NZ students to a weekend hackathon on Nov 6 - 8. Free to enter, and held at a secret location in Wellington. Dream teams of up to three, or take destiny into your own hands! COMP160 (General Programming), COSC326 (Effective Programming) and COSC360 (Computer Game Design) are to be offered in Summer School 2016. The Otago Summer School will run from 11 January - 19 February. The Computer Science department is offering a number of research bursaries this Summer. Bursaries are offered to 'returning students' - i.e. students who will continue studying CS topics next year, either as undergrads or postgrads. Each bursary is worth $500 per week for 10 weeks. Bursaries are mainly intended for students completing their 3rd or 4th years of CS, but if you're finishing your 2nd year and you're a smart cookie, it's also worth applying. You don't have to specify more than one project title - please don't specify more than three. The deadline for applications is **Tuesday 29th September**. These can be given basic control with Arduino boards, but typically have very limited sensors (if any). One solution is to suspend a camera above the pitch and send information about the locations of the BristleBots and the ball to all the players. The purpose of this project is to write software that can detect and track up to 8 BristleBots and a ball in real time from such an overhead view. This information would then be sent to the BristleBots to allow them to plan their behaviour. University of Otago researchers examining ancient DNA required a particular bioinformatics workflow to be implemented. The necessary programming and scripting work has been completed but requires significant technical experience to use. This project will develop a web interface for controlling the pipeline, and a database to manage its input data and the results generated. A stretch goal is setting up a cloud-hosted service. The University is seeking to better collate and correlate its data on energy use, both in terms of electricity and heating. This project will develop a web interface that aggregates data from a collection of existing heterogeneous data sources. Depending on time and candidates' skill-sets, integration of additional types of energy sensor may be implemented, alongside geospatial and/or mobile interfaces. The department has a somewhat ancient, but potentially capable robot that was custom-built at significant cost for some Artificial Intelligence research. The robot has spent its recent life in the Department's museum doing nothing. Far from humanoid, the robot is cylindrical in shape, and about the height of a chair. It can spin on its axis and move forwards and backwards. It has various sensors for detecting distance and movement, and has speakers and microphones. It has no limbs, and as far as we know, contains no laser weaponry. The robot contains a fairly typical, standard-sized PC motherboard of the day. That computer is independent of, but connected to, the robot control systems. This project would involve getting the robot up and running, as well as figuring out what we can and can't do with it. Basically it is a Kinect depth sensor and a projector over a sandpit. The Kinect tells us the shape of the sand, and the projector can add textures, contours, or virtual objects such as water. There is existing open source software for this, and the first step would be to install that. The current software only uses version 1 of the Kinect sensor, so the next step would be to update it to use the new (v2) sensor. Finally it is expected that you would work with another student and staff from Surveying to develop software that will be used to evaluate the AR sandpit as a teaching tool next year. Longer term we're interested in the user interface possibilities of such a device. -the-shelf, wearable and portable EEG devices available, such as Brainlink, MUSE, and Emotiv. Some interesting mobile Apps were developed for gaming and meditation. However, more interesting Apps could be designed and developed. In this project, advanced Apps based on EEG will be designed and developed based on Raspberry Pi. Celebrating the UNESCO International Year of Light, the Art and Light Exhibition features collaborations between artists and scientists around the theme of light. The exhibition is hosted by the Otago Museum and runs until 30 August. Steven Mills has been involved in the development of one of the installations, and two other artists have produced works in response to aspects of his research. "[Steven Joyce] has now revealed that the southern ICT grad school school will be hosted by the South Island Tertiary Alliance, which consists of the University of Canterbury, Christchurch Polytechnic and Institute of Technology (CPIT), Lincoln University, Otago Polytechnic and the University of Otago. It will eventually have a Christchurch campus .. and a satellite site in Dunedin." The department congratulates Mira Guise, whose PhD thesis has now been accepted. Mira's thesis is entitled 'An examination of polychronous neural groups as a potential substrate for representation'. Congratulations to Andrew Webb, whose recently-awarded PhD thesis has been placed on the Division of Science's list of 'Exceptional PhD theses'. The thesis is entitled Actions of attention, and attention to action: investigating the relationship between visual attention, episodic representation, and language. Exceptional theses are listed here. Associate Professor Ali Knott will be giving a talk on National Radio's 'Our changing world' on National Radio about his work on language and sensorimotor cognition. Two Departmental staff members (Sandy Garner, Anthony Robins) are members of the Robotics Education NZ Trust (RENZ), and very active in supporting robotics activities such as RoboCup Junior in schools. RENZ has just been awarded a $10,000 grant from Google's Computer Science for High Schools (CS4HS) programme. The purpose of the grant is to run workshops for training teachers in robotics, and thus supporting schools' robotics activities. Study abroad as part of your Otago degree. To find out more, check the Exchange week events listed here. As part of a radio interview, hear Head of Department Prof Michael Albert talk about quantum computing research with the Dodd-Walls Centre for Photonics and Quantum Technologies (a new Centre of Research Excellence). Check the link named 'Play' at the bottom of this RadioNZ page to hear the full interview. Campus tours for new students are running 16th-20th February. Details and times are here. Remember that the department offers three papers in Summer School 2015 - COMP160 (General Programming), COSC326 (Effective Programming) and COSC360 (Computer Game Design). Closing date for Summer School enrolment is 10th December. Full details of the university's Summer School papers here. The Department of Computer Science at the University of Otago offers school students the chance to learn how to program in a fun way, using robots. Many employers will be attending a Careers event to be held on Wednesday 20th August from 6-8.30pm in Com 2.03 & Com Staff Room. Congratulations to our latest completed PhD, Paul McCarthy. His thesis is entitled "Analysis of fMRI/EEG Data using Graph Theory Techniques". He was supervised by Dr Lubica Benuskova and Prof. Liz Franz (Psychology). Update: Paul is now a postdoc with the FMRIB Centre, Nuffield Department of Clinical Neurosciences, University of Oxford, U.K.
"There are many people who want to sing or join a choir but who can't read and sing music at first sight, so at the University of Otago, Judy Bellingham, from the Department of Music, teamed up with Geoff Wyvill from the Department of Computer Science to develop an app to help people learn not only to sight-sing music but also learn some basics about music in general. " Read more and listen to the Radio NZ programme here. Listen to Brendan McCane and Steve Mills on Radio New Zealand talking about Nabeel Khan's recently completed PhD thesis, which is entitled 'Self localisation in indoor environments using machine vision'. Computer Science graduate Stu Sharpe of Cannonball Software is pictured in New York with the Sports Emmy for outstanding new approaches for sports event coverage, awarded for an app which allows users to follow the action during America's Cup races: ODT story. Congratulations to the following two students who were both awarded their PhD on 27 March. Jenny McDonald - "A pragmatic tutorial dialogue system: design, implementation and evaluation in a health sciences domain". Nabeel Khan - "Self localisation in indoor environments using machine vision". - a covering letter discussing the applicant�s interests and study in relation to the type of work carried out by SLI Systems (see below). - an academic transcript (the Doctoral and Scholarships Office can provide this � just add a signed note to your application giving the University permission to provide the transcript on your behalf). Applications are due by 5pm, Monday 31 March. 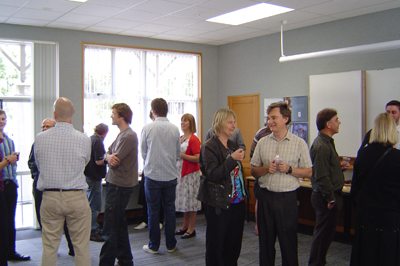 Applications must be submitted to the University of Otago Doctoral and Scholarships Office. "SLI Systems is at the forefront of developing innovative search technology, user-generated search engine optimization (SEO) services and dynamic site navigation. The company supports hundreds of ecommerce sites globally and serves millions of page views every day. SLI Systems offers an exciting work environment and employs passionate and talented Software Developers from around the world. The SLS Systems Scholarships for students attending the University of Otago have been established in 2013 to provide not only financial assistance but also networking and career opportunities for smart and tech-savvy students." 10,000 IT vacancies in NZ? "A virtual recruitment fair is hoping to attract hundreds of international candidates to IT jobs in New Zealand in a bid to fill the skills shortage facing the sector. An industry group estimates there are currently 10,000 IT vacancies [in NZ], which companies are struggling to fill. In a bid to plug that gap, recruitment website Workhere.co.nz, Immigration New Zealand, the expat network Kea and the New Zealand Technology Industry Association are hosting a virtual event called Tech Connect. Thousands of IT workers from around the world are expected to dial into the the live streamed event on 31 March, where around 50 companies are advertising 200 jobs, as well as presentations from chief executives and industry leaders. " Read more: IT sector plans recruitment drive. The department would like to congratulate Sheetal Jadhav whose PhD thesis "QoS-based handover for next generation wireless networks" was recently accepted. Sheetal's supervisors were Associate Professor Zhiyi Huang and Dr Haibo Zhang (and previously Dr Paul Werstein). She is currently working at the General Electric John F. Welch Technology Centre in Bangalore, India. Associate Professor Ali Knott's TEDx Athens talk 'The building blocks of language and perception is now available on YouTube. "Please join me in congratulating Lynn whose PhD thesis 'A natural interface for 3D manipulation' has been accepted. As a result, the convener of examiners (who just happens to be me) has made a final recommendation that she be awarded the degree of Doctor of Philosophy. Congratulations Lynn and best of luck in your future endeavours." You can see a short video of some of Lynn's work here. 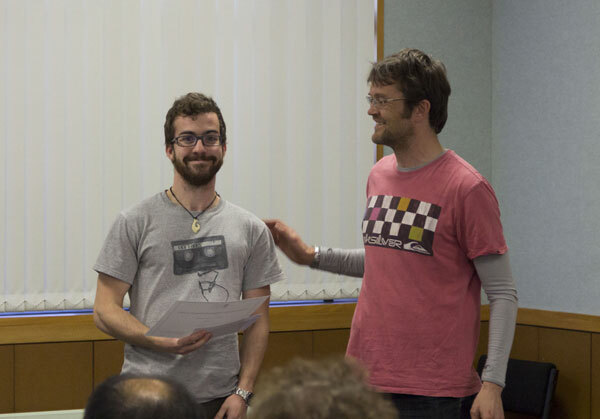 Longstanding 300-level Teaching Fellows Raymond Scurr and Matthew Jenkin have left their positions. Matthew had been in the Department since 2002. He was especially associated with the renowned COSC326 paper, Effective Programming. Raymond has had an even longer association with the Department, and first started tutoring in 1984. He then had a spell in the Maths Department, but then returned to Computer Science in 1996. Raymond is continuing as a demonstrator. The current issue of the Univerity of Otago magazine describes Associate Professor Ali Knott and Dr Lubica Benuskova and Dr Martin Takac's Marsden supported research into language and the sensorimotor system. Software Developer rated best job..
Software Developer and Computer Systems Analyst have been rated #1 and #2 in a list of 100 Best Jobs (in the USA). Also, 'Growth for both types of IT professionals should balloon: The Bureau of Labor Statistics predicts there will be nearly 140,000 brand new positions created before 2022.'. Following requests, a page listing New Zealand ICT employment resources has been created, for use by students and graduates interested in employment opportunities. Suggestions for additional resources can be sent to Robert: rpollock@cs.otago.ac.nz. Applications are due in by 1st April, 2014. Dr Kevin Novins was a valued member of the Department of Computer Science from 1995-2001 who tragically passed away in 2011. This scholarship/fellowship has been made possible by a generous bequest from the Novins family to the Alumni of the University of Otago in America. More information and how to apply here. The department can no longer subsidise student printing. Ali Knott has just given a talk at TEDx Athens. The video isn't ready yet, but in the meantime you can see a video of the talk Ali gave at TEDx Auckland last year here. Maria Mikhisor won the best student paper. Steven Mills won the best poster. The department has farewelled secretary Helen Mulholland, with a presentation at today's morning tea. Helen worked in the department for the last two and a half years. Congratulations to Ali Knott and Lubica Benuskova who have had their Marsden grant application funded. The project is called 'Does language syntax mirror the structure of sensorimotor cognition?' and the amount awarded is $652,174. Details of all the Marsden awards are here. First of all, I hope you've had a good semester. See you at the barbecue on Friday (RSVP to office@cs.otago.ac.nz if you haven't already done so), and good luck with your exams. The resources to offer these papers come directly from their enrolments -- so sign up soon please! For further information, please don't hesitate to contact me or Willem Labuschagne (willem@cs.otago.ac.nz) our adviser of studies. The Dunedin site of the South Pacific Programming Contest saw three teams from the University of Otago Computer Science Department go head-to-head with a field of 85 other teams from sites in Australia and New Zealand. Fewer than half of the SPPC teams in 2013 were able to answer more than two questions correctly, but all of our teams were able to get three questions finished. Our top performing team on the day, Breakfast Search (Stuart Austin, Nicky Crawford, and Matthew Bennett) came 22nd overall, followed closely by Team Pedro (Toby Yuretich, Cain Edie-Michell, and Tim Jacomb) and Bint Fatuma (Caitlin Miller, Vaughan Weatherall, and Nic Robertson) and many teams were close to stepping up to another question solved. Site coordinator David Eyers would like to thank Matthew Jenkin for his support throughout the year; Cathy Chandra for a number of changes that facilitated us being able to run contests within the student labs; and of course the teams for applying themselves throughout the year. Now that we are back in the routine of competing in the practice rounds (after a many-year hiatus), I look forward to building on these successes in future years! Please contact David Eyers if you are interested in competing. The 2013 OUSA teaching awards voting is about to open. Voting will run until the last day of semester two (11th October). Students can vote for one top lecturer and also the most inclusive lecturer (a disability support based award). There a prize for one lucky voter. Voting is via the OUSA website. Voting closes on the 11th October. OUSA will be letting every lecturer know they have been nominated, even if they are not in the top 10. The awards ceremony is being scheduled for the afternoon of the 25th of October. The entire Otago campus will go smoke free on 1st January 2014. This includes the grounds, so there will be no smoking in the Owheo courtyard from then on. "This Policy applies to all University of Otago employees, students, visitors, contractors, volunteers, research participants and any person on any University of Otago Campus at any time, for any reason." "University on Otago Campuses means all University of Otago buildings (including residential accommodation), grounds, vessels and vehicles owned or leased by the University of Otago." Associate Professor Maria Markosova is visiting until mid Nov 2013. She is working with Dr Lubica Benuskova on dynamic models of brain functional networks. Each student studying an under-graduate Computer Science paper has been given an allocation of 30 pages on each of the printers in the undergraduate labs. This is the hard limit, and any print job which would take the number of pages printed (since quotas were reset on Friday 26/07/13) over that total will not be actioned. There is a soft limit of 10 pages less than the hard limit which can be used as a warning that the hard limit is about to be reached. For each undergraduate course, an additional number of pages has been allocated, for each student doing the course, on the printer in the lab which is being used for the course. e.g. for COMP160 students, there is a hard quota of 30 pages for each printer in Labs A, B, C, E and F with an additional 50 pages (i.e. a total of 80 pages) on the printer in Lab C - a warning will be given if a print job will take the number of pages printed by the student on the Lab C printer over 70 (or if it will take the number of pages printed over 80 - in which case a message will be sent to say that the hard limit has been reached, and the job will not be printed). For students doing COSC242 or COSC244/TELE202 the number of additional pages is 25 split over the printers in Labs E & F, and so those students have a soft quota of 45 and a hard quota of 55 on each of the printers in Labs E and F - plus any additional pages they may have been allocated because they are taking some other course which uses either of those labs. If a student has used up all their quota, or if the quota on any printer has been used for non-CS-course-related printing, then they must go to the Computer Science Office (9-5) and request an increase in their quota for that printer. The cost for this is 10c per page, in blocks of 50 pages. Students must pay before the quota is increased. Note that the Office now has an EFTPOS machine. Students can also use cash. A successful Postgraduate Symposium was held in the Department on Monday 26/8/13. 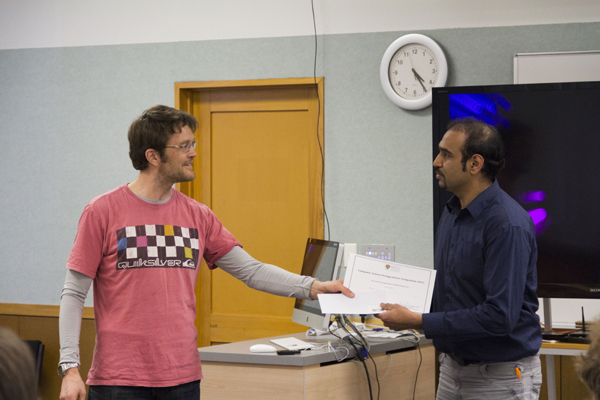 The 2013 publication prize was shared by Xiangfei Jia and Nabeel Khan. 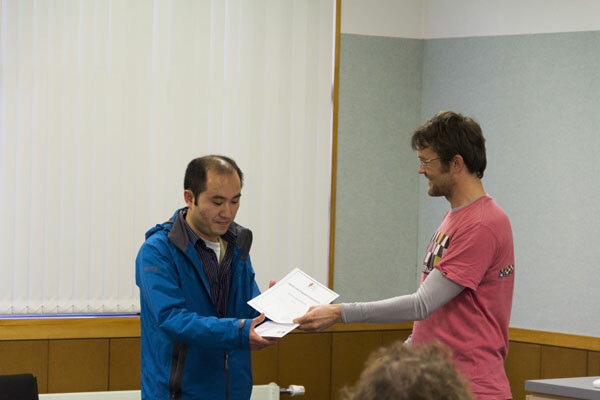 The 2013 best talk prize went to Gonzalo Sanchez-Nido, for his talk on gene coexpression networks. 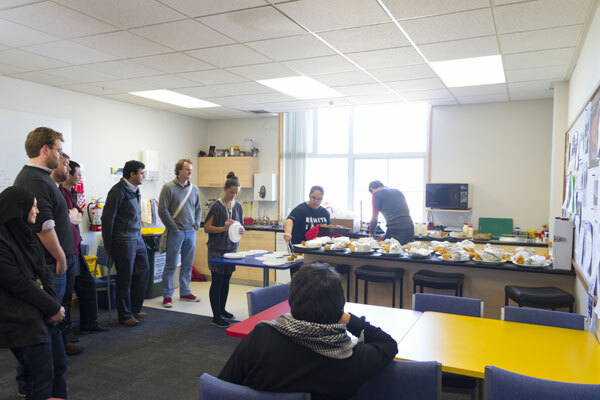 There was also a lovely hangi for lunch, provided by Te Roopu Pūtaiao (the university's Māori science students organisation). Upcoming conference - /dev/world is a conference for people who have an interest in developing for Apple computers and Apple mobile devices. It is open to the public and will be held at the Rydges Bell City, Melbourne, on September 30 and October 1, 2013. 20th August 2013, 10am-4pm, in the Link. 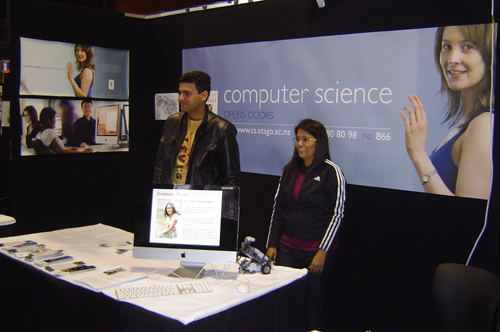 Visit 50 booths representing more than 70 areas of study (including Computer Science). Find out how you could further your career or follow your passion with postgraduate study. View more than 30 posters on display from existing postgraduates. Come and meet current postgrads from 10am- 12noon on the mezzanine floor to get the real story. Listen to why postgraduate study should be in your future. Speakers from across the University and beyond outline the benefits of postgraduate study in the Gazebo Lounge from 12noon-2pm. I have been asked to publicize Kiwi Pycon to you all (the NZ Python conference). It's a very interesting industry conference and if you go you will get to meet a lot of people who use Python in industry and you'll probably learn some useful stuff about Python along the way. The dates are 6-8th September, and the venue is at AUT in Auckland. The registration cost is very reasonable for students at $60 for the whole conference. The disadvantage for us is that it's in Auckland, but it's worthwhile going to if you are interested in Python. "Altus Financial Services is a Dunedin-based AMP Adviser Business established in 2005 to provide financial advice to personal, business and corporate clients. Altus are offering a scholarship worth $10,000 to award to a local person helping to put Dunedin on the map or whose endeavours might lead to the creation of opportunities for others around town. 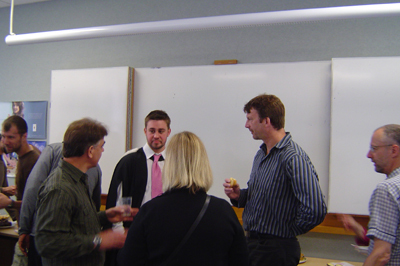 They are interested in hearing from entrepreneurial people from the Dunedin community. Last year's recipient was David Cameron, a student from the Otago School of Business, and founder of LearnCoach. The application process is done on-line: http://www.altus.co.nz/do-your-thing. Applications are now open until 31st August." "Westpac wants to collaborate with New Zealand developers & designers to identify mobile apps that will make a process, transaction, application or any other common banking activity easier, faster and safe for customers.... So, be part of the Westpac App Challenge and if we end up selecting your app for development, you'll get $10,000, the opportunity to work with us to make your concept a reality and, once your app is live in New Zealand, the opportunity to take it to the rest of the world. This event will be held on Tuesday 23 July 2013, at 2 pm in Seminar Room 106, Computer Science Department, Owheo Building, 133 Union Street East. ADInstruments and KuraCloud are currently recruiting for 5 positions based in our Dunedin, New Zealand office. We will be holding an information session where you can have a chat with our employees about working at ADInstruments and KuraCloud. The closing date for applying for these positions is 26 July 2013 - application details will be posted on Otagocareerhub. If you are interested in a career at ADInstruments and KuraCloud please come along. Web contacts as in Event 1 listing below. There will be a College of Education Teaching Expo on Thursday 1st August, in the Robertson Library, Union St East, from 11am-3pm. Find out about teaching around the world and talk to teacher recruitment organsations. There is currently a shortage of science teachers. 2pm Wednesday 17 July 2013, room 118/119 at the Hunter Centre (opposite the Dental School). 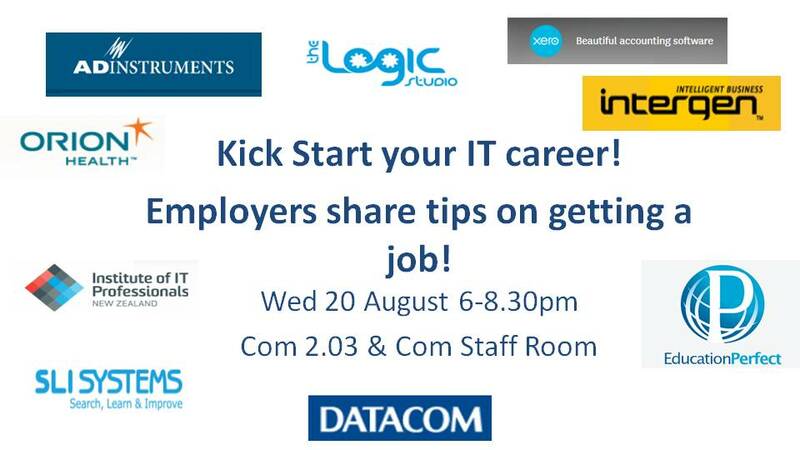 If you are interested in a career at ADInstruments and KuraCloud please come along. We look forward to seeing you there. Professor Enric Vallduví is currently visiting from from Universitat Pompeu Fabra, Barcelona, and will be here for six months. During his visit, he will continue ongoing research on the role of information structure in natural language. He will also be working with Alistair Knott on the neural basis of information structure: for instance, what are the neural processes associated with adopting a new topic, or with retrieving an answer to a question. More information about Professor Vallduví. Dr. Anita Borg (1949-2003) devoted her life to revolutionizing the way we think about technology and dismantling the barriers that keep minorities and women from entering the computing and technology fields. As part of Google's ongoing commitment to furthering Anita's vision, they announce the Google Anita Borg Memorial Scholarship 2013: Asia-Pacific (APAC). Through the scholarship, they aim to encourage women to excel in computing and technology, and become active role models and leaders. - Be a female student enrolled in full-time undergraduate or postgraduate study at an university in 2013/2014. - Be enrolled at a University in Korea, Japan, India, Southeast Asia, Australia or New Zealand. - Be studying Computer Science, Software Engineering or a closely related technical field. - Maintain an excellent academic record. The scholarship recipients will each receive a $5,000 scholarship for the 2013-2014 academic year. All scholarship recipients will be invited to visit a Google office in Sydney, Australia for a networking retreat. Following the recent resignation of Dr Shawn Martin, we have a vacancy for full-time, confirmation path position as Lecturer. Applicants should have a PhD, a commitment to on-going research and experience in teaching. Recent PhD graduates may apply. Applicants with teaching and/or research experience in any area of computer science can apply. Job description and how to apply. Department robot club member Ailsa Carroll (16) has been selected as only one of two NZ school pupils to attend the International Space Camp in the USA. Space camp includes astronaut training and using the Space Shuttle simulator. From the ODT: "Ailsa was selected ahead of thousands of other pupils around the world because of her excellent academic results and her involvement in aeronautics (flying aircraft on computer flight simulators), robotics and computer programming". Read more about Ailsa here. Computer Science honours student Jess Todd holds a 'queen of the mat' title and is preparing for the New Zealand grappling and wrestling championships, to be held in Dunedin this weekend. She also hopes to compete in the Commonwealth Games next year. Read all about Jess here. Professor and Head of Department Michael Albert is to give his Inaugural Professorial Lecture on Tuesday, 16th April 2013. The lecture is titled "How to shuffle badly". The department gives each student a free printing quota of 200 pages on their account. If students exceed this quota in the labs, they may find printing jobs will not proceed. In this case, students should go to the Computer Science Office (9-5) and request their quota is raised. The cost for this is 10c per page, in blocks of 50 pages. Students must pay before the quota is increased. Note that the Office now has an EFTPOS machine. Students can also use cash. IT jobs in NZ plentiful, money good .. There is curently a chronic shortage of ICT staff and programmers in New Zealand, reports the New Zealand Herald. Employers are resorting to hiring staff from overseas, repurposing staff with other science or engineering degrees, and offering huge daily pay rates for specialists. "The opportunities for IT workers were highlighted last month by the Ministry of Business, Innovation and Employment. According to the ministry's Occupation Outlook report, job prospects in ICT are among the best in the country, along with engineering and other professional roles. The report says strong growth in jobs for ICT and business analysts - of whom there are about 9500 earning an average of $76,700 - can be expected in the medium term. Similar growth in software development jobs is also forecast. There are about 17,000 software developers earning an average of $76,600." Which tech degrees pay the most? The article also reveals that the highest starting salaries and mid-career salaries for graduates in the computer field go to computer scientists, software engineers and computer engineers (in the USA). SLI Systems is at the forefront of developing innovative search technology, user-generated search engine optimization (SEO) services and dynamic site navigation. The company supports hundreds of ecommerce sites globally and serves millions of page views every day. SLI Systems offers an exciting work environment and employs passionate and talented Software Developers from around the world. The SLS Systems Scholarships for students attending the University of Otago have been established in 2013 to provide not only financial assistance but also networking and career opportunities for smart and tech-savvy students. 1. The value of the scholarship shall be $2500, to be paid directly into the recipient's bank account. 2. Up to two scholarships shall be awarded annually to University of Otago students enrolled in undergraduate or postgraduate study in Computer Sciences, Information Sciences, Mathematics, Science or a related field. Applicants should have a passion for coding, be detail oriented, and have an instinctive desire to solve problems. 3. Scholarships shall be awarded on the basis of academic achievement and compatibility between the award recipient and SLI Systems' culture and values. Recipients may be invited to participate in SLI Systems functions and activities. Participation, where practical, is expected. 4. The scholarship may be held together with any other award. 5. If there are no candidates of sufficient merit, no award shall be made. 6. In the event of the recipient's withdrawal from the specified course of study for which the scholarship is awarded, the scholarship will be withdrawn, and any unpaid funds shall be returned to the scholarship fund. Applications must be submitted to the University of Otago Doctoral and Scholarships Office no later than 5:00 p.m. on 30 March (if March 30 is not a business day, please submit your application on the following business day). Applications should consist of a brief C.V. and a covering letter discussing the applicant's interests and study in relation to the type of work carried out by SLI Systems. The applicant should also provide a current and official University of Otago transcript, or written and signed permission for the University of Otago to provide this on their behalf. Short 'learn to program' courses are to be offered in the department to school children of ages 9-15 (school year 5-10). Information about the courses has already been sent to all local schools for their newsletters. Full details of the courses and an online application form can be found here:Learn to program classes for school years 5-10. Computer Science Honours students Nicky Crawford and Caitlin Miller who were the only two undergraduate finalists from New Zealand for the 2012 Google Anita Borg Memorial Scholarship. Well done both! Anthony Robins and Michael Albert have been promoted to full professorships, it was announced today (20/12/12). A total of 24 leading academics have been promoted. "Announcing the new professors, University of Otago Vice-Chancellor Professor Harlene Hayne warmly congratulated them on their hard-earned and well-deserved promotions. 'Otago has rigorous processes for conferring professorships that ensure only those with suitably strong records are selected. Staff applying must demonstrate that they have made outstanding and sustained contributions in key areas including research, teaching and service to the University and community,' Professor Hayne says. Input from international experts is sought as part of the process to ensure that candidates' contributions are indeed world class, she says. 'These appointments reflect the breadth and depth of the talent we enjoy here at Otago. The work of these individuals is of enormous value to the University and is often of considerable international significance.'" Congratulations to Computer Science graduate Caitlin Miller has won a Google Internship. You can read more about these internships here. Four of the teams in this year's Software Engineering paper (COSC345) successfully got apps into the Apple app store. Two of these are games and two are drawing apps. They apps are called CatNapped, Ain't No Rocket Science, Tracer Tool and Sketchi. It has been confirmed that Associate Professor Michael Albert will take over as Head of Department from Associate Professor Brendan McCane, from 1st January 2013. MSc student Thomas verbeek is to present a workshop at /dev/world 2012. This is the Apple University Consortium's conference for Mac OS, iOS and web in Melbourne, Australia. He will be presenting a workshop entitled "Integrating the video element using HTML5" to delegates from across Australia and New Zealand. Read more on the AUC website. The latest economic news from Stats NZ reveals people who design computer systems are in hot demand. - Jobs in the industry increased by 78 percent between 2000 and 2010. - The industry had the equal-highest rate of product innovation in New Zealand in 2011. - Most Computer Systems Design companies exported their goods and services in 2011. - The workforce is concentrated in major cities, and is well educated and young, with above-average pay. - CSD businesses invest heavily in their future growth. Head of Department Brendan McCane presented two awards at the postgraduate symposium, held in the department on 27th August. Associate Professor Anthony Robins has won one of the three latest teaching excellence awards. The university awards recognise an "outstanding ability to teach". All winners receive $7,500 to support student learning and teaching. More details and a photo can be found here. Anthony has now (17/7/12) become one of only 12 recipients of a national teaching award from the National Centre for Tertiary Teaching Excellence. 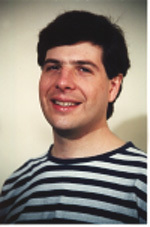 "Anthony Robins has made a significant impact in the field of computer science nationally and internationally, and is considered by his peers to be one of the leading researchers in computer science education. His unique contributions range from his involvement in developing the national curriculum in Digital Technology for secondary schools to groundbreaking research in the development of the Learning Edge Momentum model of student learning that is influencing how programming is taught. Testimony to Anthony's sustained excellence in teaching are his high student satisfaction ratings, his exceptional skills in programme design and continuing reflection and critical evaluation of his teaching performance. His teaching has been described by students as powerful and transformational; his exemplary leadership has inspired colleagues." All recipients of this award receive a cheque for $20,000. More details about the awards and Anthony's full citation can be found here. The department will be hosting the 27th Image and Vision Computing New Zealand conference. This will be held from November 26th to November 28th. The call for papers is currently open. CareerCast has rated Software Engineer as the best of all jobs in 2012, using criteria such as Work Environment, Stress, Income and Physical Demands. "The world is going digital, and Software Engineers who can help with that transformation are reaping the benefits. Their pay is great, hiring demand for their skills is through the roof, and working conditions have never been better". Tertiary Information Day will be on Monday 30th April. The department will have a booth at the Expo in the Link, and Head of Department Brendan McCane will be giving talks in the Owheo Building at 12 noon and 1pm. If you are thinking of studying Computer Science, come along and find out about what we offer and the career prospects for graduates. More details about Tertiary Information Day can be found here. Staff and student BBQ will be held in the Owheo courtyard on Friday 9th March, 2012, at 4pm. See you there! To be eligible to obtain a competitive scholarship, you should be a staff member or student of an AUC Member University and have a background in programming (Mac, Unix or Windows) and in interest in learning about the latest OS X & iOS development. - Return economy airfares to San Francisco, USA from Australia or New Zealand. - Twin-share Accommodation in San Francisco at a designated hotel for up to 7 days. Staff and Students interested in the Competitive Scholarships must apply by completing an application form available on the AUC web site. Applications close 23 March 2012. Yawen Chen has also joined the department as a Lecturer this week. To read about her background and her research interests, you can check this page. Shawn Martin has joined the department as a Lecturer. To read about his background and interests, you can check this page. Graduate Pete Bruns has created the best Tantrix playing robot, based on his COSC490 project. This robot, called 'Monte', successfully defeated the previous best bot in a game lasting 27 hours. The software is based on the Monte Carlo method. To find out more, and to challenge the robot yourself (if you dare), see the Tantrix site. PhD candidate Sheetal Jadhav has won a best paper award at the PDCAT 2011 conference in South Korea. Her paper was called "Performance Evaluation of Quality of VoIP in WiMAX and UMTS". New lecturer Steven Mills has started work in the Department. Steven is a graduate of this Department, having completed his BSc and then his PhD in the year 2000. Read more about his research interests here. I recently presented at /dev/world 2011 - Apple's developer's conference down under. My presentation was titled "Introducing the canvas element using HTML5". It was attended by delegates from Australia and New Zealand. Some students from our department also attended: Benjamin Mark, Malcolm Durling, and ex-student Tom Kirk (who attended as staff). It was great presenting and meeting with developers in the field. I had a few hours of one-on-one time with Josh Anon from Pixar, which was invaluable to me. My proposal for a presentation has been accepted for CreateWorld. This is Apple's conference for digital media, innovation and creativity in Brisbane. My presentation is titled "Playtime - Student animation work at Otago - a screening and discussion". I will be screening my 3D animation "Playtime" and provide a breakdown of the work involved in making the animation at the University of Otago. The Postgraduate symposium is to be held on Monday 29th August, in the Owheo Building. The full schedule of postgraduate speakers and their topics is available here. Read HoD Brendan McCane's comments on the 'industry-ready graduate' issue and why good programmers are so valuable in the latest COMPUTERWORLD here. You can also check their article on Dunedin IT: town and gown here. Whether you are a novice or an experienced developer, anyone can write an iOS application by simply using the tools and frameworks that are freely available. Spaces are limited and will be awarded on a competitive basis based on the information supplied in the application form. Subsidies for travel and accommodation where required will be available. This seminar will look at how institutions and students around the world are using iPad in teaching, learning, and research. It builds upon last years' AUC seminar on Mobile Learning which was delivered to over 1,300 colleagues at Australian and New Zealand AUC member universities. Various Apps will be demonstrated, case studies will be shared, and current research will be examined. Please join guest presenters at this free 90 minute seminar. Venue and Date July 15th 10:30 - 12:00 pm Hutton Theatre, Otago Museum. New data on graduate salary earning from the Chronicle of higher Education confirms the high value of a CS degree. The median income for graduates with Bachelor degrees in Computing in the USA is now about US$70,000, with the range being $50,000 to $98,000. If you want to raise an issue but don't know who your class reps are, see the noticeboard by reception. A Careers Fair of special interest to Computer Science students and graduates is being held on Tuesday 10 May from 11-2 in the Link. Among those taking part are Datacom Systems Limited, ADInstruments Ltd, Intergen Limited and Orion Health. All are particularly interested in meeting computer science students. About ninety high school students attended the talks at Owheo, and at the Expo in the Union Hall large numbers enjoyed the Lego robots, and also talking to our postgraduates Manish, Jothi, Umair and Sheetal who manned the booth for the day. Our big new banner had its first outing too! 100-level - Monday 11th April, 1pm, with Brendan - Owheo Room G34. 200-level - Wednesday 13th April, 1pm, with Willem - Owheo Room G34. 300-level - Tuesday 12th April, 11am, with Ali - Owheo Room 106. 400-level - Wednesday 20th April 1pm, with Mike - Owheo Room G34. Class reps for all levels will be meeting with staff soon to discuss any course-related concerns. Talk to your class rep if you want any issues raised. If you don't know who your class reps are, see the noticeboard by Computer Science reception. The BBQ for staff and students of the Department will be held on Friday 11th March at 4pm in the courtyard of the Owheo building. See you there! Dr Lubica Benuskova has taken up a new Editorship of the prestigious IEEE Transactions on Neural Networks. We currently have a vacancy for a Lecturer in the Department. We have a vacancy for a Lecturer in the Department. The closing date for applications is 14th April 2011. Full details, and how to apply. Sad news: Dr Kevin Novins, a Senior Lecturer in the Department up to 2001, has died in California. He had been undergoing chemotherapy. Kevin's expertise was in Computer Graphics and Computer Vision, and he worked in the Graphics group. More recently he had been working for a hedge fund in California. 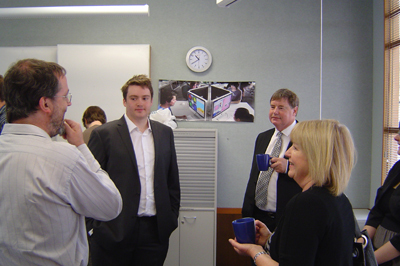 Many staff members remember Kevin with great affection. "Each year Jobs Rated researchers survey 200 jobs - from Accountant to Zoologist - scoring them according to five key criteria: Physical Demands, Work Environment, Income, Outlook and Stress.... In 2011, thanks to the popularity of smartphone applications and "cloud" based software, technical positions involving computers have risen to the top of the rankings. Indeed, Software Engineer, Computer Systems Analyst, Technical Writer and Computer Programmer all rank within the top 30 this year." Software Engineer is currently the most highly ranked job of all. 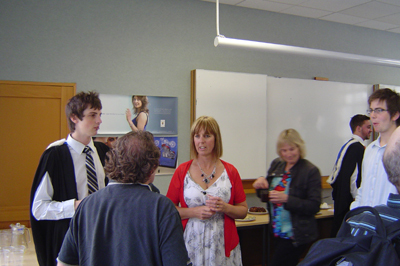 Graduate morning tea, 15th December 2010. School teams coached by Anthony Robins and Sandy Garner achieved successes in the recent Robocup competition. Teams from Balmacewan Intermediate and Logan Park won the Junior Dance and Senior Soccer categories respectively. Read more in the ODT report. The latest Apple University Consortium Magazine has a good feature on Thomas Verbeek's hang gliding simulator. The article explains how the simulator works, and the challenges Thomas had to overcome. You can read it here - Wheels for the Mind (Summer 2010 edition). The results of this year's Google AI Challenge have just been released. The task was to write a program (bot) that would play games against bots of other players. Among over 4600 participants from 112 countries, there were 24 from New Zealand, among them four people from our department - Lech Szymanski, Andrew Webb, Martin Takac and Vaughn Wood. Our best result was achieved by Lech, who ranked the 287th total and the 2nd best within New Zealand. Although he is probably not satisfied with the result, congratulations Lech! (The other Otago guys scored 9, 10 and 12th within NZ). This Friday's AI seminar at 4-5pm in the AI lab on the 2nd floor will be devoted to the contest, everybody welcome. A friend of Prof Anthony Robins, Michael Kerrisk, has just published a book called 'The Linux Programming Interface'. It's a detailed technical reference and, with hundreds of working programs and exercises, a potentially advanced text book. Check it out online at http://man7.org/tlpi/. The Computer Science Department and Cathy Chandra get acknowledgment and thanks for the loan of access to various flavours of Unix on which some of the cross platform comparisons were based. National Novel Writing Month (NaNoWriMo) is a yearly writing challenge founded in 1998 by Chris Baty. Participants attempt to write a 50,000 word novel over the course of the 30 days of November. NaNoWriMo has been growing as a worldwide literacy movement since that first year consisting of a few bored college students, and at present there are over 130,000 participants signed up worldwide for 2010. An interdisciplinary team of Professor Chris Ackerley (English), Dr Murat Genc (Economics), Professor Douglas Russell (Chemistry, Auckland), and Associate Professor Michael Albert won the Open teams event at the Queenstown Bridge Congress. Professor Geoff Wyvill will talk on 'Prior Art' at the CS and IS seminar on Friday (15th October), at 1pm in Archway 2. When was the Zoopractiscope invented? Why was Rembrandt ignored in the history of Computer Animation? What do Gavin Miller, Andy Pearce and John Woodwark have in common? Geoff will explain some of these things and confuse you about others! Senior Lecturer Lubica Benuskova has been named a best ambassador for Dunedin in a Tourism Dunedin competition. She has won a year's free rates, a certificate and tickets to the Chinese Garden for her work promoting the city. The Department of Computer Science and Areo are offering a one year scholarship towards the thesis year of an MSc degree in the area of in Computer Vision. The stipend is $20,000 and the closing date is November 2nd, 2010. More details here (PDF file). Timed to run in conjunction with the teaching & learning focussed "Mobility in Education" seminars, these free 3 hour hands-on workshops will focus on the most important parts of the iPhone SDK to get you started writing Apps for Apple mobile devices - the iPhone, iPod Touch and iPad. The Computer Science department is hosting one of these workshops. The workshop is aimed specifically at students who study computing science, computer engineering, information technology, mathematics, creative arts/design or related disciplines and/or have an interest in developing applications for these portable devices. Staff from member Universities are also welcome to attend. Workshops will be run around New Zealand (and Australia) and are strictly limited to the first 25 applicants. Dr Zhiyi Huang is organising the The 2010 International Workshop on Programming Models and Applications for Multicores and Manycores (to be held December 8-11, 2010, Wuhan, China). "Rapid advancements in multicore and chip-level multi-threading technologies open new challenges and make multicore systems a part of the computing landscape. From high-end servers to mobile phones, multicores are steadily entering every single aspect of the information technology. However most programmers are trained in sequential programming, yet most existing parallel programming models are prone to errors such as data race and deadlock. Therefore to fully utilise multicore hardware, parallel programming models that allow easy transition of sequential programs to parallel programs with good performance and development of error-free codes are urgently needed. This workshop is dedicated primarily to gather researchers and practitioners addressing the main challenges and share experiences in the emerging multicore software engineering and distributed programming paradigm, and in addition, to provide a discussion forum for people interested in programming environments, models, applications and tools specifically designed for parallel multi/many-core hardware environments." Student Jason Mair has had a paper accepted at the E2GC2 (Energy Efficient Grids, Clouds and Clusters) workshop. About the workshop: "The question of energy savings has been a matter of concern for a long time in mobile distributed systems. However, for the large-scale non-mobile distributed systems, which nowadays reach impressive sizes, the energy dimension just starts to be taken into account. The E2GC2 workshop will focus on Green and energy efficient approaches, ideas, practical solutions, experiments and framewords dedicated to medium and large scale distributed infrastructures like Grids, clouds and clusters." The Apple University Consortium has announced they will be holding a 2 day conference for University staff and students who develop on the Apple platform. A pre-conference 'Understanding Cocoa' full day workshop will also be offered. DevWorld 2010 will be held at the Rydges Hotel in Melbourne on the 28th and 29th September 2010 and will feature a wide range of presenters from the Apple developer community as well as sessions covering a wide range of subjects including iOS development, Snow Leopard, Xcode, Objective C, Core Animation and many others. Registration closes on 17 September 2010 and spaces are limited. Registration & Travel Subsidies: http://www.auc.edu.au/DevWorld+Subsidy. Sandy Garner, Alistair Knott and Anthony Robins helped organise and run the RoboCup Junior Otago competition for school students in Otago and Southland on August 7th. Over 100 students took part in three robotic events, Dance, Search and Rescue, and Soccer. The event was covered by the Otago Daily Times and photos (by Sam Mann) can be seen here. Professors Mike Atkinson and Michael Albert talked recently at the Permutation Patterns conference in Dartmouth college. Student Hayden Walles has won a 2010 Division of Sciences Exceptional Thesis award for his thesis A perpetual basis for noun phrase syntax. (Primary supervisor Dr Alistair Knott). A thesis is of exceptional quality when all three examiners of a candidate's thesis agree that the thesis is of an exceptional standard in every respect - research content, originality, quality of expression and accuracy of presentation - and is amongst the top 10% of theses examined. More information on the awards here. Ikarus Security Software (Austria's leading IT Security company) offered Natascha Chrobok a position after reading her recent paper "Advantages and Vulnerabilities of Pull-Based Email-Delivery" published in the Proceedings of the 2010 Australasian Information Security Conference. Natascha studied email spam prevention under the guidance of Dr. Trotman and Dr. O'Keefe. She is awaiting the marking of her Masters thesis. We wish her all the best in her new position. In this video Head of Department Professor Brendan McCane explains what Computer Science is all about, and why our graduates have such great career prospects. To view the video go here. Dr Andrew Trotman was elected Secretary of ACM SIGIR, a 3 year appointment. SIGIR is the leading academic Special Interest Group on Information Retrieval. It supports research into all aspects of IR research including: theory, HCI, efficiency, and accuracy. This will be Professor Michael Albert, from Thursday 1st July, for the six-month period of Professor Brendan McCane's sabbatical. Class rep meetings are to be held this week and next week. Students - if you do not know who your class reps are, check the noticeboard in the corridor in front of Owheo Computer Science reception. Your class reps can raise any issues of concern with staff. 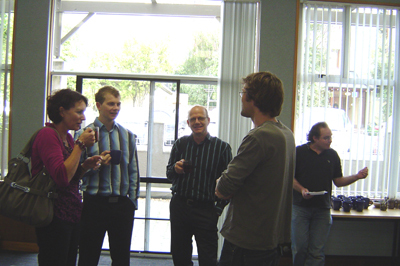 HE KITENGA, the University of Otago Research Highlights publication for 2009 has a large article called "Maths modelling aids brain research" which describes the work on computational modelling of neurobiological data by our senior lecturer Lubica Benuskova. The Department will be at booth 36 in the Union Hall on Tertiary Information Day on Monday 3rd May. There will also be presentations about the career opportunities for Computer Science graduates in Room 1.06, Owheo Building, at 12 noon and again at 2pm. 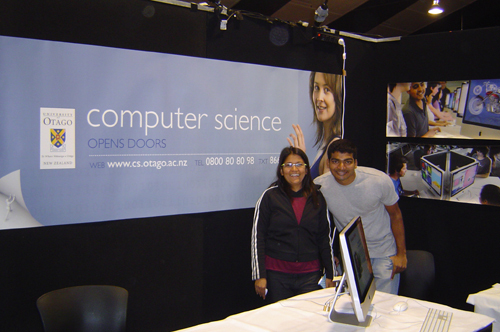 If you are considering studying Computer Science at Otago, stop by at the booth for a chat, or come to one of the presentations. See you there! We have a current vacancy for the position of Lecturer. Applications close 10th May, 2010. See the full details on our Employment page. Lecturer Ali Knott has been trapped in Europe by the flight disruptions caused by the Icelandic volcano, but we are hoping to see him back by Tuesday to give his scheduled lecture. Student Benjamin Humphrey has won sponsorhip to attend the Ubuntu Developer Summit, which is being held in Belgium in May. Student Thomas Verbeek has won a two year Apple University Student Developer Scholarship, following his impressive performance with his project application and interview. The scholarship includes a MacBook Pro, membership of the Mac Developer Program and the iPhone Developer Program, support to attend Apple conferences in 2010 and 2011, and the chance to participate in the Apple USA internship program. More information about the scholarships themselves is available at the AUC web site. Dr Paul Werstein, who has been a lecturer in the Department since 1995, is retiring from the Department at the end of the month. Dr Janet Rountree, who has been a lecturer since 2007, is also leaving us this month to take up a new challenge. Class Rep meetings are being held, starting this week. Meetings between staff and class representatives are being held, starting this week. One meeting is held for each level (100, 200, 300 and 400). If you want to bring up an issue, talk to or email your class rep. Class rep names and photos and contact details will be put up in the Owheo foyer, by Reception, soon. A successful student and staff BBQ has been held. The Department's first BBQ of the year was held on Friday 12th March, in the Owheo courtyard, and indoors, due to the weather. There was a great turnout by staff and students. 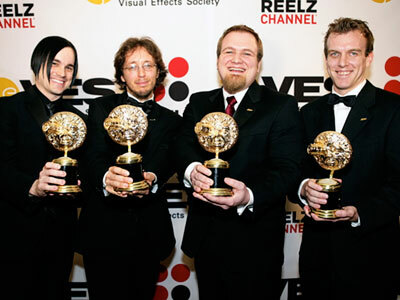 Departmental alumnus Alexis Angelidis and three others have won their category 'Outstanding Effects Animation' in an Animated Feature Motion Picture (Up) at the VES (Visual Effects Society) Award ceremony in Los Angeles, which was otherwise dominated by awards to the movie 'Avatar'. See details of all the awards here. Well done Alexis! Thanks to Sui-Ling for the news and the links. The Global Game Jam has finished for another year, with over 950 games being created in a 48 hour period. 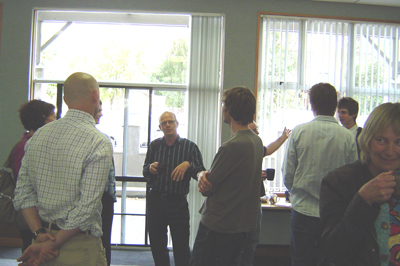 The Computer Science department hosted the event, one of three in New Zealand. On Friday evening the theme for the games was announced as"Deception", with additional constraints / sub-themes of 'Cakes, Snakes, Lakes'. Approximately 15 people worked over the weekend to produce 3 finished games, which can be seen here. The event is fantastic fun, and is a great test, not just of your programming or artistic skills, but also design, teamwork and project management. A special thank you to everyone involved in setting up and supporting the event. Some photos of the Game Jam can also be seen here. are all working on the theory of permutation classes with Mike Atkinson and Michael Albert. is working on combinatorial game theory with Michael Albert. The Global Game Jam is an event where teams from around the world attempt to create complete games in 48 hours. Currently there are 138 locations from 39 countries taking part. Our teams in Dunedin will be among the first to start, as the event begins at 5pm Friday in each location. It is not easy building a game that is fun to play (especially in 48 hours), it is a complex system of ideas that interact together and result in an unique player experience. Games tell stories, share ideas, teach and communicate a lot about our culture and show us how other cultures interpret the same idea. Best of all, after the Global Gam Jam is done, everyone will have all those games to play on the website archive! Students enjoyed our 3-D Programming project in Hands on Science. See you next year! Four Summer School Papers on offer! You can study COMP112 (Web Development), COMP160 (General Programming), COSC326 (Effective Programming) and COSC360 (Game Design) at the Summer School. Paper details here. The outlook for IT graduates is excellent despite the current economic circumstances. Read the full details from NZICT. Photos from our 25th Anniversary celebrations can now been be viewed online. Congratulations to Heidi McQuillan! Details of her real estate system and her win here. Celebrations begin at 1pm, in Owheo. The semester 2 staff student BBQ will be held in the courtyard of the Owheo building, Friday 11th September, 4pm. The entire department has moved to the Owheo building on the corner of Union St and Forth St.
Computer Science is celebrating its 25th anniversary next month.